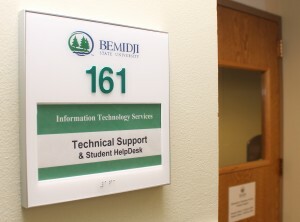 Located in Deputy Hall, Bemidji State University’s ITS department is responsible for network infrastructure, academic technologies, and BSU’s web presence. The Network & Server group is responsible for programming, network infrastructure, server administration, network security, VOIP phones, print and imaging, and IT project management. The Web Services group works closely with the Office of Communication and Marketing. It is responsible for public and internal websites and web server configuration. The Support team is responsible for the help desk, classroom technology, computer labs and classrooms, desktop and systems administration, software and hardware licensing, and purchasing. If you’d like more information about BSU ITS, please feel free to contact us.